This past Saturday The Chandeliers and Champagne girls kick started Oktoberfest at the biggest festivity on earth at Steam Whistle Brewery. 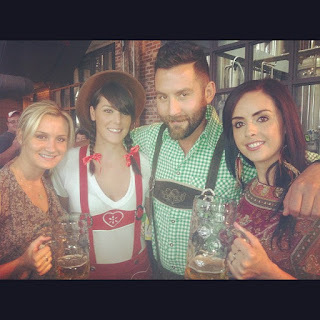 The girls joined Cam & Greg and Brewmaster Marek as they kicked off Oktoberfest with a ceremonial keg-tapping in Toronto hosted by George Kash and the Oktoberfest Express. The festival included litre steins of Steam Whistle Pilsner, gigantic doughy pretzels, lip-smacking sausage & sauerkraut, folk dancers, and arm-linked crowds joined in revelry and refreshments. CIBC Run for the Cure!